The Hippo-YAP signaling pathway is altered and implicated as oncogenic in many human cancers. However, extracellular signals that regulate the mammalian Hippo pathway have remained elusive until very recently when it was shown that the Hippo pathway is regulated by G-protein-coupled receptor (GPCR) ligands including lysophosphatidic acid (LPA) and sphingosine 1-phosphophate (S1P). LPA inhibits Lats kinase activity in HEK293 cells, but the potential involvement of a protein phosphatase was not investigated. 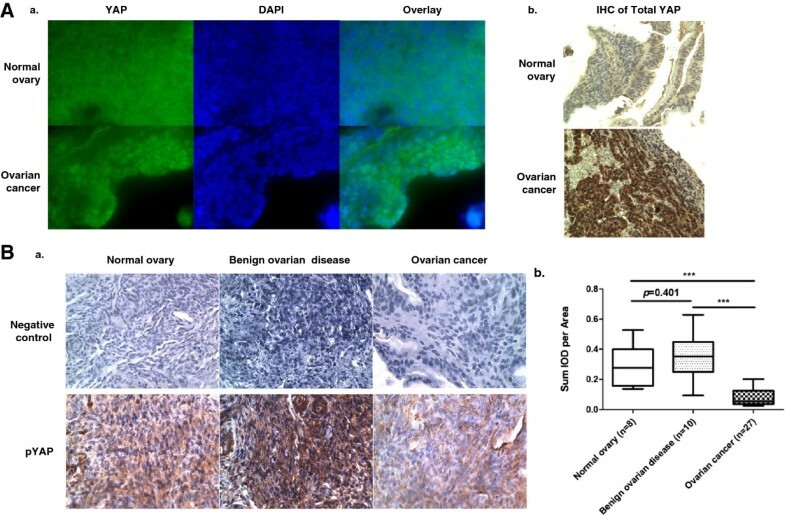 The extracellular regulators of YAP dephosphorylation (dpYAP) and nuclear translocation in epithelial ovarian cancer (EOC) are essentially unknown. We showed here that LPA dose- and time-dependently induced dpYAP in human EOC cell lines OVCA433, OVCAR5, CAOV3, and Monty-1, accompanied by increased YAP nuclear translocation. YAP was involved in LPA-induced migration and invasion of EOC cells and LPA3 was a major LPA receptor mediating the migratory effect. We demonstrated that G13, but not or to a lesser extent G12, Gi or Gq, was necessary for LPA-induced dpYAP and its nuclear translocation and that RhoA-ROCK, but not RhoB, RhoC, Rac1, cdc42, PI3K, ERK, or AKT, were required for the LPA-dpYAP effect. In contrast to results in HEK293 cells, LPA did not inhibit Mst and Lats kinase in OVCA433 EOC cells. Instead, protein phosphatase 1A (PP1A) acted down-stream of RhoA in LPA-induction of dpYAP. In addition, we identified that amphiregulin (AREG), a down-stream target of YAP which activated EGF receptors (EGFR), mediated an LPA-stimulated and EGFR-dependent long-term (16 hr) cell migration. This process was transcription- and translation-dependent and was distinct from a transcription- and YAP-independent short-term (4 hr) cell migration. EOC tissues had reduced pYAP levels compared to normal and benign ovarian tissues, implying the involvement of dpYAP in EOC pathogenesis, as well as its potential marker and/or target values. A novel LPA-LPA3-G13-RhoA-ROCK-PP1A-dpYAP-AREG-EGFR signaling pathway was linked to LPA-induced migration of EOC cells. Reduced pYAP levels were demonstrated in human EOC tumors as compared to both normal ovarian tissues and benign gynecologic masses. Our findings support that YAP is a potential marker and target for developing novel therapeutic strategies against EOC. Many pathways originally identified for their function in development have subsequently been shown to be involved in tumorigenesis. Among them, the Hippo-YAP (Yes-associated protein) signaling pathway plays a key role in the regulation of organ size by inhibiting cell proliferation, promoting apoptosis, and limiting stem/progenitor cell expansion in epithelial tissues. YAP was originally identified using antibodies against the amino terminal domain of the Yes protein and is negatively regulated by Hippo-pathway kinases via phosphorylation of Ser127, which results in YAP 14–3–3 binding, cytoplasmic retention, and degradation. Bioactive lipids LPA and sphingosine-1-phosphate (S1P) were recently identified as extracellular regulators of YAP signaling in HEK293 and mammary cell lines[1, 4]. The Hippo-YAP pathway is altered and implicated as oncogenic in a variety of human cancers, including epithelial ovarian cancer (EOC). In particular, high levels of nuclear YAP (nYAP), or low levels of cytoplasmic phosphorylated YAP (cpYAP), are associated with poor survival from EOC. In vitro assays show that YAP is involved in increased cell proliferation, resistance to cisplatin-induced apoptosis, faster cell migration, and anchorage-independent growth in EOC OVCA432 and OVCAR8 cells[5, 6]. However, the extracellular regulators and detailed mechanisms of YAP signaling in EOC cells are essentially unknown. The oncogenic role of bioactive lipids, especially LPA, in EOC cells has been amply demonstrated by our lab and others; LPA promotes tumor cell proliferation, survival, adhesion, migration, invasion, and metastasis in vitro and in vivo[7–14]. LPA acts through six known G protein-coupled receptors (LPA1-6)[15, 16]. We have shown that LPA2 and LPA3, but not LPA1 or LPA4, are involved in LPA-induced cell migration of EOC cells[7, 9, 10, 17, 18]. Both LPA1 and LPA3 were implicated in LPA-induced YAP activation in HEK293 cells. LPA3 has been shown to be coupled predominately to Gq proteins and also to Gi proteins[19–21], but not previously to G12 and/or G13. YAP is a transcriptional co-activator, but the downstream targets of YAP pertinent to cancer cell migration have been only minimally studied. Interestingly, amphiregulin (AREG), an epidermal growth factor receptor (EGFR) ligand, has been identified as a target of both YAP and TAZ; AREG is a secreted factor that contributes to YAP-mediated cell proliferation and migration in MCF10A and neighboring cells[22, 23]. The importance of LPA signaling in EOC prompted our investigation of the potential regulation of YAP by LPA in EOC cells. YAP activation was assessed by its dephosphorylation (dp) and nuclear translocation. The effects of YAP activation on cell migration and invasion were studied. The YAP signaling pathway in EOC cells was identified using pharmacological reagents and genetic forms of signaling genes, as well as siRNAs. Importantly, YAP activation in human tumor, benign, and normal tissues was examined to demonstrate the translational potential of this pathway in EOC. We tested whether LPA affected the dephosphorylation of YAP (dpYAP) at ser127 in EOC cells. LPA induced dpYAP in a dose- and time-dependent manner in OVCA433 cells with the maximal effect at 2 hr and at 20 μM of LPA (Figure 1A). Similar LPA effects on dpYAP were observed in a different EOC cell line OVCAR5 (Figure 1B). In addition, we tested two more EOC cell lines, CAOV3 and Monty-1, and found that LPA also induced dpYAP in these cells (Figure 1C). Concomitantly, LPA induced YAP nuclear translocation in both EOC cell lines tested (OVCA433 and OVCAR5) (Figure 1D and1E). These results indicate that as in HEK293 cells, LPA is an extracellular regulator of YAP activation in EOC cells, and the effect is not limited to one EOC cell line. Since TAZ is a paralog of YAP, we also tested the effect of LPA on dephosphorylation of TAZ (dpTAZ). As shown in Figure 1F, LPA also induced dpTAZ in OVCA433 cells, although the time-dependence of the effect was different. LPA-induced dpYAP and YAP nuclear translocation in EOC cells. OVCA433 (A) and OVCAR5 (B) cells were starved for 16 hr, then treated with LPA (10 μM) for different times or with different concentrations of LPA for 2 hr. Western blots analyses and quantification methods were described in Materials and Methods. Representative results are shown from three independent experiments. * P < 0.05, ** P < 0.01, *** P < 0.001. C, LPA (10 μM, 2 hr)-induced dpYAP was tested in two more EOC cell lines. 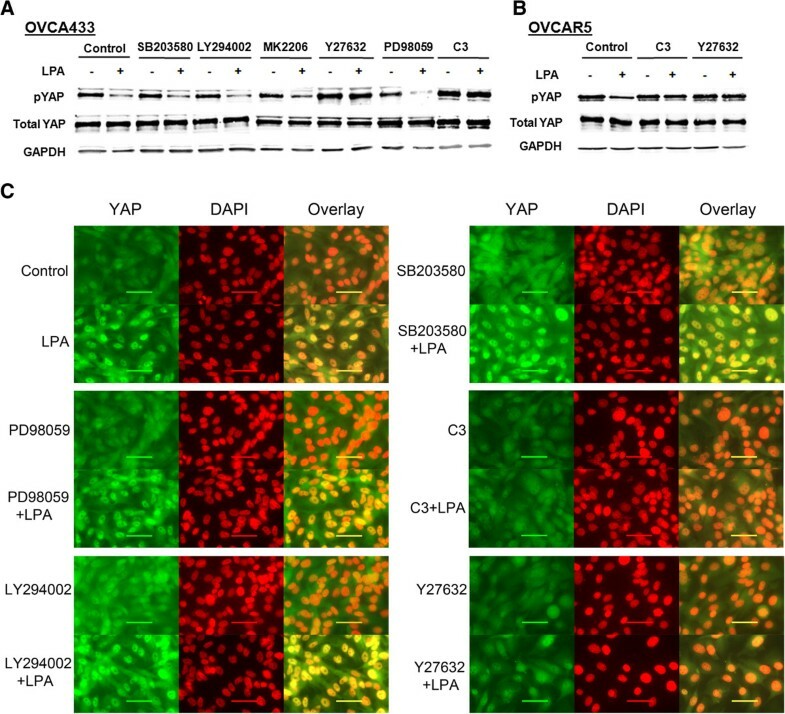 D and E, LPA-induced YAP nuclear translocation is shown in OVCA433 and OVCAR5 cells. Green: YAP; red: DAPI. F, LPA (10 μM) time-dependently induced de-phosphorylation of TAZ. The potential involvement of YAP in LPA-induced cellular functions was tested. YAP was effectively down-regulated using siRNA (Figure 2A) and LPA-induced migration (tested at 16 hr) and invasion (tested at 24 hr) (Figure 2B and2C) were significantly reduced in both OVCA433 and OVCAR5 cell lines, supporting the functional role of YAP in LPA signaling. 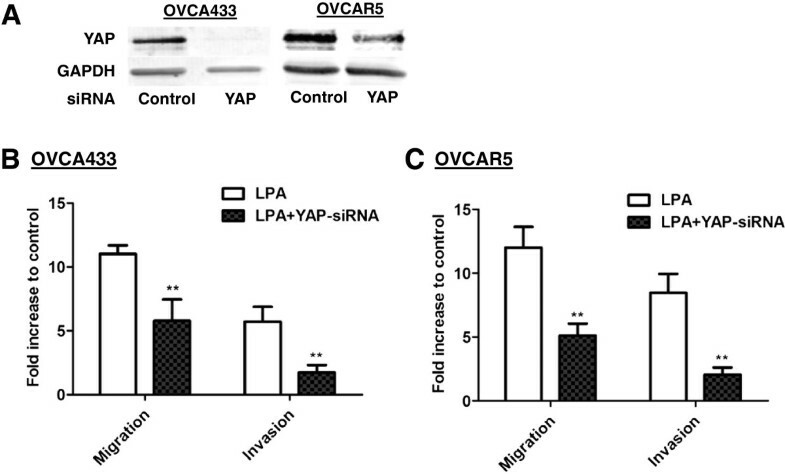 LPA-induced migration and invasion of EOC cells was reduced by YAP-siRNA. A, Reduced YAP expression by YAP siRNA in OVCA433 and OVCAR5 cells detected by Western blot. B and C, The effect of down-regulation of YAP on cell migration and invasion induced by LPA (10 μM) in OVCA433 and OVCAR5 cells (conducted 48 hr-post siRNA treatment). The results are from three independent experiments. ** P < 0.01. LPA activates cellular effects via Gi-PI3K-MAPK, Gq-PLC-PKC, and/or G12/13-Rho pathways[19, 24]. Selective pharmacological inhibitors and reagents were used to dissect the signaling pathway leading to the LPA-YAP effects. LPA (10 μM for 2 hr)-induced dpYAP and nuclear translocation of YAP were not affected by the PI3K-Akt or MAP kinase (p38; MEK-ERK) pathways, but were completely abolished by the Rho inhibitor C3 transferase, as well as by the Rho-kinase (ROCK) inhibitor Y27632 in OVCA433 cells (Figure 3A). C3 transferase and Y27632 also blocked LPA-induced dpYAP in OVCAR5 cells (Figure 3B). The pharmacological sensitivities of LPA-induced YAP nuclear translocation were consistent with the dpYAP revealed by Western blot analyses, suggesting that the two processes are closely coupled (Figure 3C). LPA-induced dp-YAP and YAP nuclear translocation were dependent on Rho/ROCK, but independent of PI3K, MEK, p38, and AKT. After starved from FBS for 16 hr, cells were pretreated with different inhibitors, SB203580 (10 μM), LY294002 (10 μM), Ki16425 (10 μM), MK2203 (1 μM), Y27632 (10 μM), PD98059 (30 μM) for 1 hr, and C3 (1 μg/mL) for 2 hr prior to stimulation with LPA (10 μM, 2 hr). pYAP expression in OVCA433 (A) and OVCAR5 (B) cells was analyzed by Western blot. C, OVCA433 cells were treated as described in A. Cells were fixed and stained for YAP (green). Cell nuclei were stained with DAPI (red). Representative results are shown. Most EOC cell lines express LPA1-3 receptors. Ki16425, a dual inhibitor for LPA1 and LPA3 inhibited LPA-induced dpYAP and nuclear translocation of YAP in OVCA433 cells (Figure 4A), suggesting that one or both of these receptors are involved. Selective blockage of LPA1-4 was achieved utilizing specific siRNAs as assessed by quantitative PCR (Figure 4B). Down-regulation of LPA3, but not LPA1 or LPA4, reversed LPA-induced dpYAP in OVCA433 cells (Figure 4B). Although down-regulation of LPA2 resulted in reduced dpYAP, three independent experiments showed that the effect was not statistically significant (P = 0.078) (Figure 4B, c). Additional studies in OVCA433 and other cell lines are needed to further define the role of LPA2 in LPA-YAP effect. LPA 3 , but not or to lesser extent LPA 1 , LPA 2 , and LPA 4 , mediated the LPA-dpYAP effect. A, OVCA433 (a) and OVCAR5 (c) cells were starved and pretreated with Ki16425 (10 μM) for 1 hr prior to treatment with LPA (10 μM, 2 hr). pYAP was analyzed by Western blot. (b) The effect of Ki16425 on LPA (10 μM, 2 hr)-induced YAP nuclear translocation in OVCA433 cells. Green: YAP; red: DAPI. Representative results are shown. B, (a) The mRNA levels of LPA receptors after siRNA-treatment in OVCAR433 cells were determined by quantitative real-time PCR. Normalized expression values are given as percentage of control siRNA treated samples (means ± SD of three independent experiments). *** P < 0.001. (b) LPA (10 μM, 2 hr)-induced dpYAP effects were determined in LPA receptor specific siRNA-treated cells (48 hr post-transfection). (c) Quantitation of Western blots from (b) presented as fold decrease of pYAP after LPA stimulation compared to unstimulated controls. The data are means ± SD from three independent experiments. * P < 0.05. C, D and E, Cells were pretreated with PTX (100 ng/mL, 16 hr) or transfected with different dn plasmids for 48 hr, starved and then treated with LPA (10 μM, 2 hr). Cell lysates were analyzed by Western blot. Representative results are shown. Pertussis toxin (PTX), a specific inhibitor of Gi protein, and dominant negative (dn)-forms of G proteins were used to determine which trimeric (large) and small G proteins were involved. LPA-induced dpYAP was insensitive to PTX (Figure 4C), suggesting that Gi proteins were not involved. The results from cells transfected with different dn-forms of large and small G proteins showed that G13 and RhoA were necessary for the LPA-induced dpYAP. The experiments indicated that Gq, Rac1, cdc42, RhoB, and RhoC, were not at all or much less involved in the effect, and G12 may be involved to a small extent (Figure 4D and4E). Yu et al. have shown that LPA induces dpYAP mainly via suppression of Lats1/2, but does not have effects on Mst. We tested the effect of LPA on Mst and Lats in EOC cells. Consistent with the results in HEK293 or MEFs, LPA did not induce changes in pMst [Mst1 (T183) and Mst2 (T180)] (Figure 5A). However, in contrast to the results in HK293 cells, LPA (10 μM) did not affect pLats (S909) during the same time period when it induced dpYAP (0–2 hr) (Figure 5A). PP1A was involved in LPA-induced dpYAP and cell migration. A, Starved OVCA433 cells were treated with LPA (10 μM) for different times, and pMst1/2 and pLats were analyzed by Western blot. B, Starved OVCA433 and OVCAR5 cells were pretreated with OA (100 nM, 1 hr), followed by LPA (10 μM, 2 hr). pYAP and pTAZ were analyzed by Western blot. C, OVCA433 cells were treated as described in (B) and the effect of OA on cell migration was tested. *** P < 0.001. D, OVCA433 cells were transfected with control, PP1A, or PP2A siRNAs for 48 hr. The cells were starved for 16 hr and treated with or without LPA (10 μM, 2 hr). Cell lysates were analyzed by Western blot for pYAP. E, Specific down-regulation of PP1A or PP2A proteins. F, OVCA433 cells were transfected with the vector or the ca-RhoA plasmid, and then treated with or without OA (100 nM, 4 hr). RhoA expression was examined in cell lysates by Western blot analyses. LPA-induced dpYAP could be mediated by activation of its protein phosphatase (PP). Interestingly, the catalytic subunit of protein phosphatase-1 (PP1A) has been shown to dephosphorylate YAP to induce its nuclear accumulation and transcriptional activation in Hela and HEK293 cells, and is associated with resistance to cisplatin in YAP-transfected EOC cells. 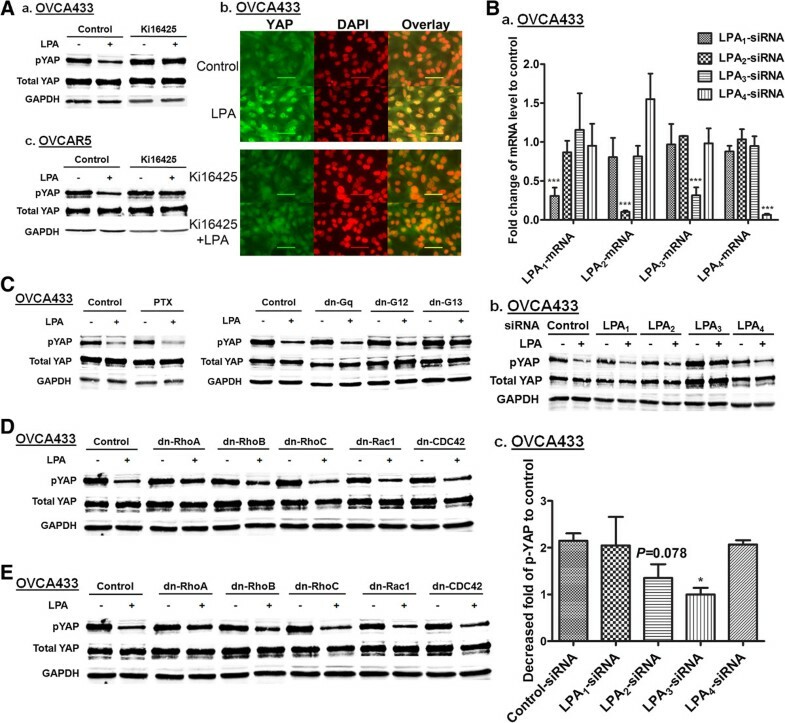 Okadaic acid (OA; 100 nM), an inhibitor of PP1A and PP2A, almost completely reversed the LPA-dpYAP effect in both OVCA433 and OVCAR5 cells (Figure 5B), and strongly inhibited LPA-induced cell migration in OVCA433 cells (Figure 5C), suggesting that one or more protein phosphatases (PPs) are involved in dpYAP in EOC cells. OA treatment also reversed LPA-induced dpTAZ (Figure 5B), consistent with an important role for a PP in LPA-induced dephosphorylation of YAP and TAZ in OVCA433 cells. To determine which PP was involved, siRNAs against the catalytic subunits of PP1 and PP2 were used. LPA-induced dpYAP was reversed by the PP1A but not the PP2A siRNA, suggesting that PP1A is activated by LPA and YAP is likely to be a direct substrate of PP1A (Figure 5D). The specificity of the siRNA down-regulation of PP1A and PP2A is shown in Figure 5E. To determine whether PP1A is up- or down-stream of RhoA-ROCK, we used the constitutively active (ca) form of RhoA (G14V). The ca-RhoA was able to induce dpYAP in an OA-sensitive manner, suggesting that PP1A was down-stream of RhoA (Figure 5F). The expression of transfected RhoA was confirmed using RhoA antibody (Figure 5F). The mechanisms by which YAP signaling affects cell migration has been only minimally studied. Since YAP is a transcriptional co-activator and AREG, an EGFR ligand, has been identified as a YAP and TAZ target[22, 23], we tested whether EGFR was involved in LPA-induced cell migration in a YAP-dependent manner. We found that AG1478, an EGFR selective inhibitor, did not inhibit LPA-induced dpYAP, but did inhibit LPA-stimulated cell migration (Figure 6A, a, b), suggesting that an EGFR ligand may be a target of YAP. We tested AREG directly and showed that indeed, AREG induced an AG1478-sensitive cell migration (Figure 6A, c). The involvement of EGFR and AREG was further supported by the actions of a second EGFR inhibitor, PD153035 on both pYAP and migration (Figure 6A, a and b). 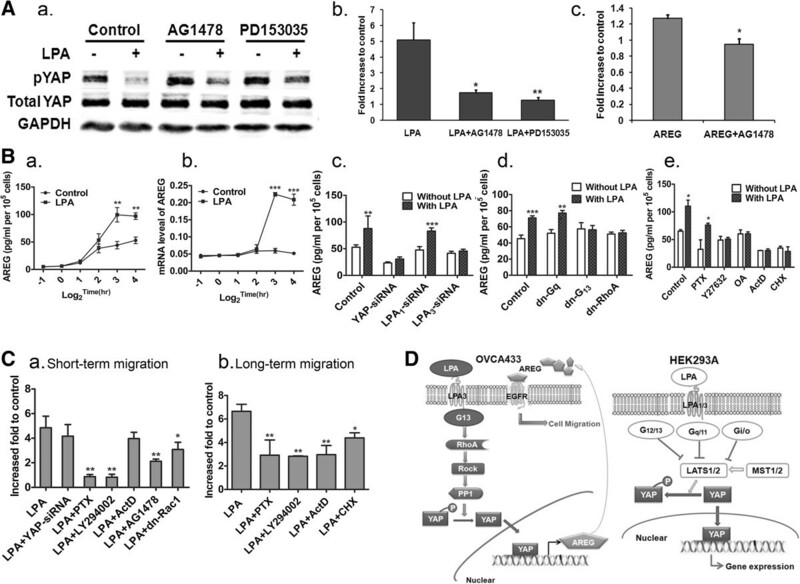 YAP-dependent amphiregulin (AREG) production/secretion mediated EGFR-dependent LPA-induced cell migration. A, The effects of AG1478 (1 μM, 1 hr pretreatment) and PD153035 (4 μM, 1 hr pretreatment) on LPA-dpYAP (a), or cell migration (b); AREG (100 pg/mL) induced AG1478 (1 μM, 1 hr)-sensitive migration of OVCA433 cells (c). * P < 0.05. B, Basal and LPA (10 μM)-induced AREG in conditioned media (CM) of OVCA433 cells (a). mRNA level of AREG was increased by LPA (b). LPA (10 μM, 8 hr)-induced AREG in CM was YAP- and LPA3-, but not LPA1-dependent (c). LPA-induced AREG production/secretion was blocked by dn-G13, dn-RhoA, but not PTX (100 ng/mL, 16 hr) or dn-Gq (d and e). C, LPA-induced short-term migration (4 hr) was not dependent on YAP or transcription (ActD, 1 μg/mL, 1 hr pretreatment), but was sensitive to PTX (100 ng/mL, 16 hr), LY294002 (10 μM, 1 hr pretreatment) and dn-Rac1 transfection (a). LPA-induced long-term cell migration was sensitive to ActD and CHX treatment (20 μg/mL, 1 hr pretreatment), as well as PTX and LY294002 (b). Data are from three independent experiments (means ± SD). * P < 0.05, ** P < 0.01. D, Summary the LPA-YAP signaling pathway revealed in this work (OVCA433 cell line, left panel) and the previous work  (HEK293A cell line, right panel). OVCA433 cells demonstrated a basal secretion of AREG, as measured by an increased AREG in conditioned medium over time. LPA (10 μM) stimulated AREG secretion above the basal level, correlated to the increase in AREG mRNA expression, which peaked at 8 hr (Figure 6B, a, b). 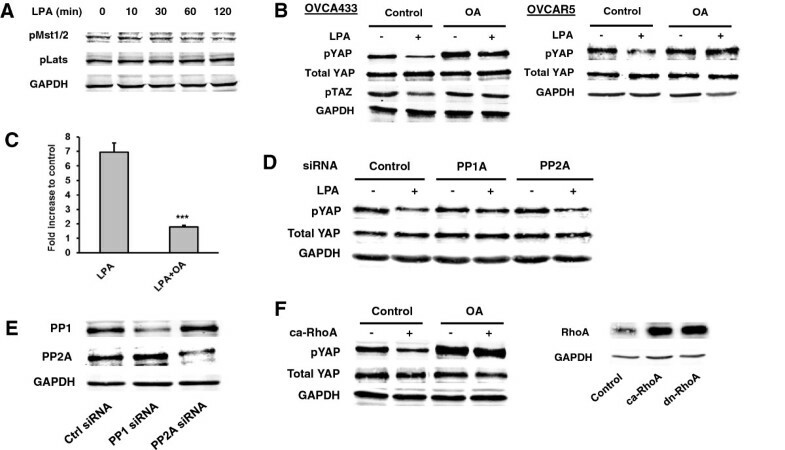 An siRNA against YAP reduced both basal and LPA-induced AREG secretion from the OVCA433 cells (Figure 6B, c). To confirm the signaling pathway, we tested the potential involvement of several key molecules in AREG section. As shown in Figure 6B, c, down-regulation of YAP and LPA3, but not LPA1, completely abolished LPA-induced AREG secretion. LPA-induced AREG secretion was also sensitive to dn-G13, dn-RhoA, Y27632, and OA, but not PTX or dn-Gq (all tested at 8 hr) (Figure 6B, d and e), consistent with the LPA-induced YAP signaling pathway. In addition, LPA-induced AREG secretion was actinomycin D (ActD) and cyclohexamide (CHX)-sensitive, suggesting that both transcription and translation processes are involved (Figure 6B, e). LPA-induced cell migration has been extensively studied in EOC and other cancer cells[7, 10, 17, 27, 28]. However, the current work is the first to show the involvement of YAP in LPA actions in EOC cells. Relatively short times (~ 4 hr) are traditionally used for Transwell migration studies in EOC cells. Since YAP is a transcriptional co-activator, we tested migration over a longer time (all migration data shown above were from 16 hr assays). To compare the involvement of YAP in short- versus long-term migration, we conducted parallel studies and identified two phases of LPA-induced cell migration. The short-term LPA-induced cell migration was YAP and transcription-independent (Figure 6C, a), and highly sensitive to PTX and LY294002, suggesting that this process was mainly controlled by a Gi-PI3K pathway. Similarly, Rac is well-known to be involved in LPA-induced cell migration[29, 30] and we showed that dn-Rac 1 inhibited LPA-induced short-term migration (Figure 6C, a). In contrast, the long-term LPA-induced migration was YAP-, transcription-, and translational-dependent (Figures 6C, b and2B,2C). It was not surprising to find that the long-term migration was also sensitive to PTX and LY294002, but to a lesser extent (Figure 6C, b), since the long-term migration was comprised of both short- and long-term phases. Interestingly, both short- and long-term migration were partially AG1478-sensitive (Figure 6C, a and6A, b), suggesting that at least two different mechanisms were involved in LPA-EGFR crosstalk in these cells. We tested human tissues (normal, benign gynecological mass, and EOC tumor) for the presence and cellular location of total YAP and/or pYAP. The demographic and clinical data for the subjects are shown in Tables 1 and2. As shown in Figure 7A, although both normal and EOC tissues express YAP, the protein was differentially located in the cytoplasm and the nucleus of normal and the EOC tissues, respectively. In addition, EOC tissues had lower levels of pYAP (brown color indicates positive staining; Figure 7B shows representative data). These results are highly consistent with two recent studies[5, 6], but this is the first time that pYAP was examined and detected in benign tissues. pYAP expression was low in EOC tissues when compared to both normal and benign ovarian tissues. A, Immunofluorescence staining of total YAP (green) in normal and EOC tissues showed that YAP was mainly cytosolic and nuclear (blue) in normal and EOC tissues, respectively (a). Different locations for total YAP in normal and EOC tissues were confirmed by IHC (b). B, EOC tissues express lower levels of pYAP than normal and benign tissues. The top row shows the negative controls of IHC when the first antibody was not added. Representative pictures are shown (a). Summary of the quantified IHC results from normal ovary (n = 8), benign ovarian tissues (n = 10), and EOC tissues (n = 27) (b). Data shown here support the novel concept that LPA can stimulate two potentially overlapping phases of cell migration with short- and long-terms (4 and 16 hr, respectively), mediated by two distinct (but possibly overlapping) cell signaling pathways. Most previous studies focused on the short-term migration involving the Gi-PI3K pathway, and potentially Ras, Rac1, and other factors[7, 9, 10, 17, 27, 28, 31–35]. LPA-induced cell migration during this time period does not require newly transcribed and/or translated factors. We now demonstrate a distinct signaling pathway leading to LPA-induced long-term cell migration in EOC cells, which was YAP-dependent and relied on transcription and translation to generate factors, including AREG. These new concepts remain to be tested further in additional EOC and other cell types, but are highly significant for both basic science and translational purposes. The EGFR and LPA pathways are likely to overlap and interact in a cell type-dependent manner. We also showed that YAP was required for LPA-induced cell invasion, which is likely to be related to long-term cell migration and requires protease activities. LPA-induced AREG secretion in a YAP- and time-dependent manner, involved a novel signaling pathway in EOC cells and LPA-EGFR signaling crosstalk. LPA-induced EGFR transactivation was first reported in 1997 and could be mediated through intracellular signals, including Src-mediated signaling[35, 37], proteinase-mediated cleavage of pro-EGFR ligands such as pro-heparin-binding EGF-like growth factor (pro-HB-EGF), as well as transcription-dependent processes[38–42]. The proteases (MMP-2, MMP-9, uPA, ADAM1, ADAM 17; expression or shedding) activated by LPA in EOC and other cell types are either up- or down-stream of EGFR[34, 35, 38, 41]. Together with our data, these results suggest that multiple cell type- and time-dependent mechanisms are involved in LPA-EGFR crosstalk. More recently, Rosenbluh et al. have shown that β-catenin-driven cancers require a YAP1 transcriptional complex for survival and tumorigenesis, further expanding the spectrum of YAP-regulated down-stream targets in colon and other cancers. Both LPA1 and LPA3 are involved in LPA-induced YAP activation in HEK293 cells. We showed that LPA3, but not LPA1, was needed for LPA-induced YAP activation in OVCA433 EOC cells. This is consistent with the potential negative regulatory role of LPA1 in EOC cells revealed by tissue expression and functional assays[7, 9, 17, 44, 45]. LPA3 has been shown to be coupled predominately to Gq proteins and can also be coupled to Gi proteins[19–21]. Direct coupling of LPA3 to G12 and/or G13 to activate Rho has not been demonstrated. Our data, however, implies that LPA3 may have a direct coupling to G13-Rho. While this coupling needs further validation, our data has expanded the understanding of LPA3 signaling. The potential roles of LPA5 and LPA6 in LPA-YAP signaling remain to be tested. LPA-induced dpYAP could be mediated via inhibition of its kinases (Lats) and/or activation of its protein phosphatase (PP). Phosphorylation of Mst1 (at ser183) or Mst2 (at ser180) is required for their activation; phosphorylation of ser909 of Lats by Mst is required for Lats activity. LPA did not affect Mst activation, consistent with results in HEK293 and MEF cells. While inhibition of Lats1/2 kinase activity was shown to be the major mechanism by which LPA activates YAP in HEK293 cells, we found that LPA did not have a significant effect on Lats activation or inhibition [assessed by using the specific phospho-Lats1 (ser909) antibody]. In contrast, our data suggest that activation of PP1A is required for the LPA-YAP effects in EOC cells. Importantly, PPs have only been shown to be negatively involved in LPA-induced effects previously[47–50]. We presented a positive effect of PP in LPA signaling mediated by G13 coupling. These apparently trimeric-G protein-dependent and potentially time-dependent negative and positive roles of PPs in LPA signaling are highly intriguing and warrant further studies. In addition, we presented evidence that PP1A is a down-stream target of RhoA-ROCK, either directly or indirectly. It is worth noting that several of the inhibitors/reagents that effectively blocked LPA-induced dpYAP also significantly increased the basal levels of pYAP or total YAP, including Y27632 and C3 (Figure 3), the siRNA against LPA3 (Figure 4B), dn-G13 (Figure 4C), and OA (Figure 5). These up-regulations were highly reproducible, and suggest that the targeted genes are involved not only in LPA- regulated, but also basal levels of pYAP in these cells. Further understanding of this effect will require additional studies. We showed that LPA was also able to regulate TAZ, a paralog of YAP, in EOC cells, although the current work is mainly focused on YAP. 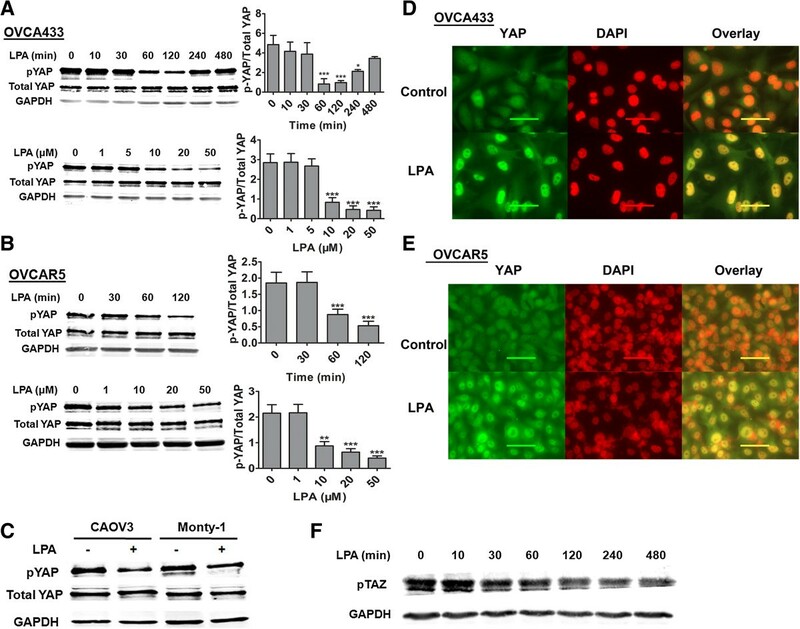 Interestingly, while the LPA-dpYAP effect peaked at 1–2 hr in EOC cells, the dpTAZ effect induced by LPA in OVCA433 persisted at 4 hrs, suggesting that these two proteins may have overlapping and distinct cellular effects. The role of TAZ in EOC remains to be studied. LPA is involved in many aspects of EOC pathogenesis and development and is a major target for EOC treatment[14, 51, 52]. Further study of the signaling mechanisms of LPA will be important for basic science as well as for translational applications. Although YAP has been implicated as an oncogene in EOC[5, 6], its regulation in EOC cells was totally unknown. While LPA is a confirmed target in EOC[51, 53], how to target LPA in EOC has been under hot pursuit. In particular, since LPA is small molecular lipid and has a very broad spectrum of normal physiological roles, targeting LPA effectively and selectively for cancer treatment is a great challenge. If the YAP pathway is further confirmed to mediate the important roles of LPA in EOC, alternative approaches can be developed. The majority of EOC subtypes examined here were serous (24 of 27), with one endometriod, one stromal and one unknown (Table 2). Zhang et al. have shown that the association of YAP with poor survival is predominantly in clear cell tumors, independent of stage. We did not have the clear cell subtype in our study, but we observed a definite decrease in pYAP in EOC serous tumors as compared to control tissues, suggesting that pYAP might be also a good marker for identifying the predominant and deadly serous EOC. In particular, one of the challenges in EOC diagnosis and monitoring is the difficulty of distinguishing benign from malignant ovarian or other gynecological (GYN) diseases. Our results shown in Figure 7, although limited in the number of samples, suggest that reduce dpYAP is specifically associated with malignancy with less or no involvement in benign GYN diseases. The data remain to be validated in larger cohorts. Although LPA has been shown to be an extracellular regulator of the Hippo-YAP pathways in HEK293 and breast cancer cells, the current studies not only represent the first demonstration of LPA-YAP signaling in EOC cells, but also reveal several innovative aspects of this signaling. These include the new concept of short- versus long-term cell migration induced by LPA; LPA3-G13 coupled signaling; RhoA-ROCK as an upstream regulator of PP1A; PP1A, but not Lats kinase, as a major regulator for LPA-induced dpYAP; and AREG as a down-stream YAP effector to mediate LPA-induced long-term cell migration of EOC cells. In addition, we tested and confirmed dpYAP expression in human EOC[5, 6], further demonstrating the translational potential of this pathway. Normal ovary, benign ovary, and ovarian cancer tissues were purchased from the Cooperative Human Tissue Network (CHTN; Philadelphia, PA); the usage of these tissues was approved by an Indiana University School of Medicine IRB. All tissues were pathologically examined. Among the 10 benign tissue samples used, three were cystadenoma, three were fibroma, and others were endometriosis, cortical inclusion cysts, Brenner tumor and cystadenofibroma. Oleoyl-LPA was purchased from Avanti Polar Lipids (Birmingham, AL). The following inhibitors or reagents were used in this study: SB203580, PD98059, and LY294002 (Enzo Life Sciences, Farmingdale, NY), MK2206 and Y27632 (Biovision, Milpitas, CA), C3 exoenzyme (Cytoskeleton, Denver, CO), Ki16425 and PD153035 (Selleckchem, Houston, TX), okadaic acid (OA) and AG1478 (Calbiochem, San Diego, CA), pertussis toxin (PTX; Invitrogen, Grand Island, NY), actinomycin D (ActD) and cyclohexamide (CHX; Sigma-Aldrich, St. Louis, MO). YAP, phospho-YAP (Ser127), phospho-Lats1 (Ser909), phospho-Mst1 (Thr183), phospho-Mst2 (Thr180), RhoA(67B9), and PP2A antibodies were from Cell Signaling (Boston, MA). GAPDH, p-TAZ (Ser89) and PP1 antibodies were from Santa Cruz Biotechnology (Santa Cruz, CA). Alexa fluor secondary antibodies were from Life Technologies, Grand Island, NY. The dn and ca forms of large and small G protein constructs were from UMR cDNA Resource Center (Rolla, MO). The OVCA433 cells were obtained from Dr. R. Bast (M.D. Anderson) and the OVCAR5 cells were obtained from ATCC (Manassas, VA). Both cells lines were tested and authenticated in 2012 by Biosynthesis, Inc. (Lewisville, TX) using short tandem repeat analysis. Monty-1 is a primary EOC cell line developed and given to us by Dr. E. Lengyel (University of Chicago). All cell lines were maintained in a humidified atmosphere at 37°C with 5% CO2. OVCA433 cells were cultured in RPMI 1640 with glutamine, 10% FBS (ATCC, Manassas, VA), and 100 μg/mL penicillin/streptomycin (P/S). CAOV3, OVCAR5 and Monty-1 cells were cultured in DMEM with glutamine, 10% FBS (ATCC, Manassas, VA), and 100 μg/mL P/S. For serum starvation, cells were incubated in growth medium without FBS or antibiotics. LPA treatment was always in cells starved from serum for 16 hr. Western blot analyses were conducted using standard procedures and proteins were detected using primary antibodies and fluorescent secondary antibodies (IRDye800CW-conjugated or IRDye680-conjugated anti-species IgG, Li-Cor Biosciences, Lincoln, NE). The fluorescent signals were captured on an Odyssey Infrared Imaging System (Li-Cor Biosciences, Lincoln, NE) with both 700- and 800-nm channels. Boxes were manually placed around each band of interest, and the software returned near-infrared fluorescent values of raw intensity with background subtraction (Odyssey 3.0 analytical software, Li-Cor Biosciences, Lincoln, NE). OVCAR433 or OVCAR5 cells were seeded in chamber slides. After treatment, cells were fixed with 4% paraformaldehyde-PBS for 15 min. Following blocking in 5% goat serum with 0.3% Triton X-100 in PBS for 60 min, cells were incubated with YAP primary antibody (1:100 dilution) overnight at 4°C. After three washes with PBS, cells were incubated with Alexa Fluor 488- or 555-conjugated secondary antibodies (Invitrogen, 1:500 dilution) for 2 hr at room temperature. Slides were then washed three times and mounted. Immunofluorescence was detected using a Qimage Retiga 2000Rcamera (Surrey, BC, Canada) at 60× magnification). For frozen tissues, 5 μm sections were prepared and subjected to immunostaining as described. The formalin-fixed paraffin-embedded sections (5 μm thick) of the normal ovaries, ovaries with benign diseases, or ovarian cancer were analyzed by IHC using the primary YAP or p-YAP antibody (1:100) and a biotin-conjugated secondary antibody. For IHC quantification, the sections were analyzed using Nikon TE2000-s microscope (Melville, NY). Four randomly selected areas were photographed at 40× magnification using a Qimage Retiga 2000Rcamera (Surrey, BC, Canada). The images were analyzed using the Image-Pro Plus image analysis software (Media Cybernetics, Rockville, MD). 6-well plates were seeded with 5 × 104cell/well in 2 mL media 24 hr before transfection; cells were 80%–90% confluent. Cells were transfected with siRNA (100 pmol/well) or plasmid DNA (4 μg/well) using Lipofectamine 2000 Reagent (Life Technologies, Grand Island, NY) according to manufacturer’s instruction. After 48 hr of transfection, cells were starved for migration and invasion assays. All siRNAs were purchased from Santa Cruz Biotechnology (Santa Cruz, CA). Migration and invasion assays were conducted using Transwell plates with 8 μm pore size membranes (Corning Inc., Corning, NY) as described previously. After incubation for 4 or 16 hr (for migration assays) or 24 hr (for invasion assays), cells remaining in the upper side of the filter were removed with cotton swabs. The cells attached on the lower surface were fixed and stained using crystal violet and washed with water. Cells were counted with five high power fields per membrane and results were presented as the mean number of cells migrated per field per membrane. All experiments were conducted in triplicate. After siRNA transfection for 48 hr, cells were washed with cold PBS and collected in the Qiagen RLT lysis buffer (Qiagen, Valencia, CA). RNA was extracted with an RNeasy mini kit (Qiagen, Valencia, CA) and reverse transcribed by M-MLV reverse transcriptase. Quantitative real-time PCR was performed on a Light Cycler 480 (Roche, Indianapolis, IN) with a SYBR Green I Master Mix (Roche, Indianapolis, IN). mRNA abundance was normalized to GAPDH. Negative controls contained no transcript or reverse transcriptase. RNA from three separate cell pellets per treatment was analyzed. Relative gene expression was calculated using the method given in Applied Biosystems User Bulletin No. 2. (P/N 4303859B), with non-targeting siRNA-treated cells acting as the control in each data set. Primer pairs used in this study were: GAPDH: F, 5′-GAAGGTGAAGGTCGGAGT-3′/R, 5′-GAAGATGGTGATGGGATTTC-3′; LPA1: F, 5′-AATCGAGAGGCACATTACGG-3′/R, 5′-GTTGAAAATGGCCCAGAAGA-3′; LPA2: F, 5′-TTGTCTTCCTGCTCATGGTG-3′/R, 5′-TCAGCATCTCGGCAAGAGTA-3′; LPA3: F, 5′-TGCTCATTTTGCTTGTCTGG-3′/R, 5′-GCCATACATGTCCTCGTCCT-3′; LPA4: F, 5′-CTTCGCAAGCCTGCTACTCT-3′/R, 5′-GGCTTTGTGGTCAAAGGTGT-3′; AREG: F, 5′-GGGAGTGAGATTTCCCCTGT-3′/R, 5′-AGCCAGGTATTTGTGGTTCG-3′. Conditioned media were collected and stored at −80°C until ELISA assays were conducted. ELISA assays were performed using a Human Amphiregulin DuoSet ELISA Development System (R&D Systems. Minneapolis, MN) in triplicate wells according to the manufacturer’s instructions. The optical density at 450 nm was measured on an automated plate reader (PerkinElmer, Santa Clara, CA). Experiments were repeated three times. The Student’s t-test was utilized to assess the statistical significance of the difference between two treatments. A P value of less than 0.05 was considered significant. An erratum to this article is available at http://dx.doi.org/10.1186/1478-811X-11-92. This work is supported in part by the National Institutes of Health (RO1 155145 to YX); and the Mary Fendrich-Hulman Charitable Trust Fund to YX. We thank Dr. Lengyel for Monty-1 cell line and Dr. Caryl Antalis for her critical reading and editing of this manuscript. The authors declare no completing interests related to this work. HC conducted all the experiments presented in this work. YX made central contributions to conception and design of the studies; analysis and interpretation of data. Both authors were involved in drafting the manuscript and giving final approval of the version to be published. Each author has participated sufficiently in the work to take public responsibility for appropriate portions of the content.